Eugene and Han Ji Min are just two of the beautiful actresses gracing the pages of the July edition of Harper's Bazaar Korea. Ha Ji Won also appears in the issue. Eugene turns up the glamour in her beauty feature lensed by Kim Sangon while Han Ji Min has fun in her eclectic editorial photographed by Hong Janghyun. I love the way they're both respectively styled. Han Ji Min is lovely but I've never actually seen any of her work. I passed on her two most recent dramas Padam Padam and Rooftop Prince. The former just seemed way too depressing and I just don't care for the male lead in the latter. Both models are stunning, I'm becoming more and more of a fan of the editorials you publish! Loved the glamour of the first two photos, the model is gorgeous. Any idea who the first gold dress is by? That gold and white embroidered jacket is stunning. She's absolutely beautiful. I find Korean women in general to be gorgeous and immaculately dressed. They are beautiful. I love that gold dress she's wearing in the 2nd pic. Simply breathtaking. Thanks for sharing this Rowena. Hey Rowena! Hope all is well :) Wow.. She's beautiful! Great photos, great fashion. Star studded frames are soo swag! Their so beautiful! Lovely pics! just gorgeous! The doe eyed look in the last picture is pretty perfect! My most favorite must be the third photo. Your editorials always look stunning, I really enjoy looking at them for some inspiration. Hope all is well with you Rowena - get plenty of rest and get well. Perfect eye make up in that first photo! Beautiful girls, love the dress in the third photo - gorgeous! It's a very nice editorial and these dresses are beautiful. Love these photos too. The first one is perfect. The model is very elegant. 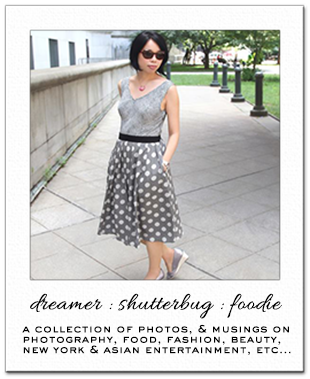 I'm so taken aback by the gorgeous styling, Rowena! Those two beautiful women and this amazing photographer made an amazing editorial!!! Hope you’re all having a great week, sweetie! Absolutely gorgeous! Hmm, I sure love red/black stripey top and tiered skirt look! Also loving the make up in the HB shoot - perfect winged eyes & full on glamour! So many amazing movies coming out! Can't wait for the Dark Knight Rises! Yippeeee! Hope you're well doll. 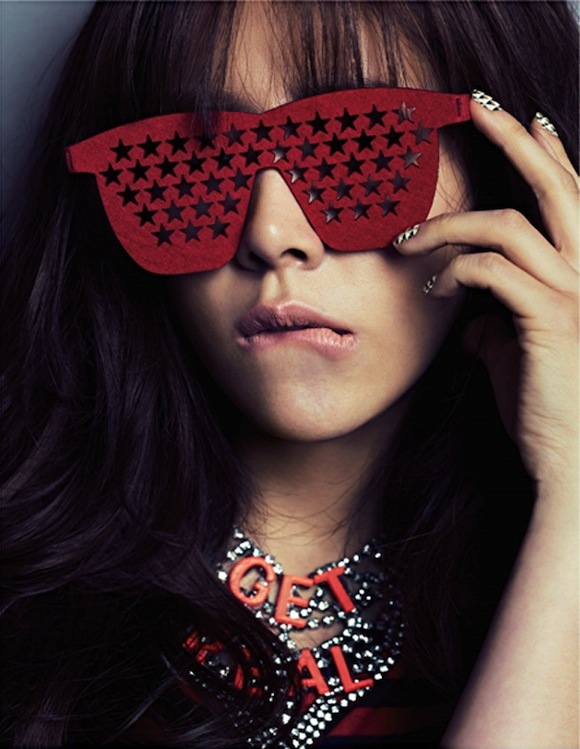 I really love that pic with the star glasses. What a lovely photo spread. She's gorge! Beautiful ladies in gorgeous clothing. I love the dress in the first pic. I wish I had an excuse (and a budget) to wear something like that. Such stunning photos, absolutely beautiful! Amazing editorial! in love with the dreamy lighting and the cover look for Eugene. I guess if i get the mascara you mentioned, my lashes will miraculously look like han ji min's. or i just need fake lashes hehe. I coincidentally did save some of those photos of han ji min from another blog i swear by for photos, korean lovers photoblog(photos 1-3 and last have got to be my favorites). Ji min just look friggin gorgeous and edgy and her hair is gorgeous with lots of volume. I definitely agree with other readers in saying that I love all the editorials you choose to post on your blog. You post just the right amount and when you post i will read the whole thing and look at everything haha.